Coventry House International and Ontesol offer the best TESOL/TEFL courses in the world. 5-week TESOL course in Toronto, recognized by Trinity CertTESOL and TESL Canada Standard 1. 4 spaces left for course starting in October! 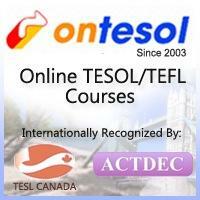 100-hour online TESOL certificate, recognized by ACTDEC UK Level 1. Receive professional training in Grammar, Phonology, and Methodology. We used our 10 years of experience delivering the best TESOL courses and developed an affordable option for those who are interested in starting their teaching career without having to spend a fortune. This is one of the few online courses that teach trainees how to create professional lesson plans. Our 250-hour online TESOL Diploma is one of the best programs in the world. It covers more than any 4-week on-site course and it is recognized at the same level as some of the most reputable Canadian universities. Upon completion of the 250-hour TESOL Diploma and the 20-hour Practicum, trainees are eligible for TESL Canada Professional Standard 2 certification.